I live by the ocean. Just a few feet above sea level. Sea-level living is all right, I guess — oxygen is easy to come by. But sometimes I wonder what life might be like up at higher elevations. I mean, way up. Like in the very highest city in the world. 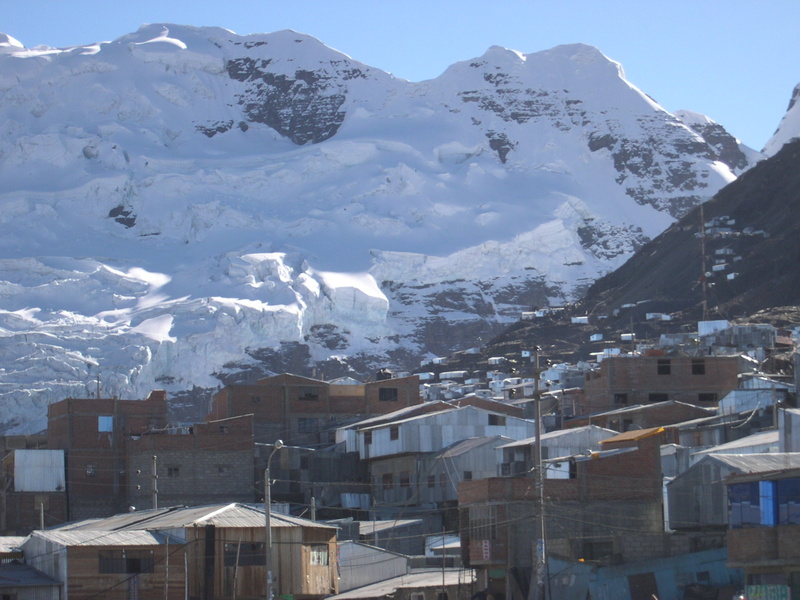 That city, as it turns out, is La Rinconada, Peru. Here’s a google map of its location. La Rinconada sits at about 5100m above sea level. To put that in perspective, consider that 5100m is higher than any peak in the Alps or the Rocky Mountains. It’s higher than any point in the contiguous United States. In all of Canada, there are less than a handful of mountains that reach higher into the sky than does this small Peruvian city. Up above the tree line, above the grass line, on top of a glacier is La Rinconada. So what would compel anyone to migrate so far upward? Well. That’s easy. Gold! Good old-fashioned gold. Decades ago, La Rinconada popped up as a temporary camp for Andean gold miners. But as the price of gold soared in the 2000s, mining seemed like ever more profitable work. La Rinconada’s population swelled, increasing by more than 200% over 8 years. As of 2012, the population is about 50,000. This National Geographic article reports that the mining companies in the region pay their employees by means of a very old and curious system called cachorreo. Under this system, miners work without pay for 30 days, and then on the 31st, in lieu of cash, they get to keep whatever ore they’re able to carry out of the mountain. Interesting exchange. Whatever traces of gold happen to exist in the heap of rocks you lug out are yours to keep! Sometimes you strike it rich. Other times you don’t. It’s lottery tickets instead of a paycheque. Because of La Rinconada’s remote location, there hasn’t been much infrastructure development. No garbage dump. No plumbing. No police station. The city is often described as lawless, because there’s no one there to enforce any laws. But there is electricity — there has been since 2002. So that’s nice. Here’s a picture of the city. And this multimedia essay has some more neat photographs and detailed description of life at the top of the world. Research suggests that the vertical human survivability limit is about 6000m. Beyond that, sustained human survival just doesn’t work. And even in the 5000-6000m range, the scarcity of oxygen can lead to various illnesses and physiological deterioration that hasten death. Life is tough going in the highest city in the world. But on a bright sunny day, up on those peaks…well, there must be some pretty views.